You guys, I'm kicking myself for not taking a photo of the sweet little tumbler pre-cuts I found last weekend at Primitive Gatherings Quilt Shop. 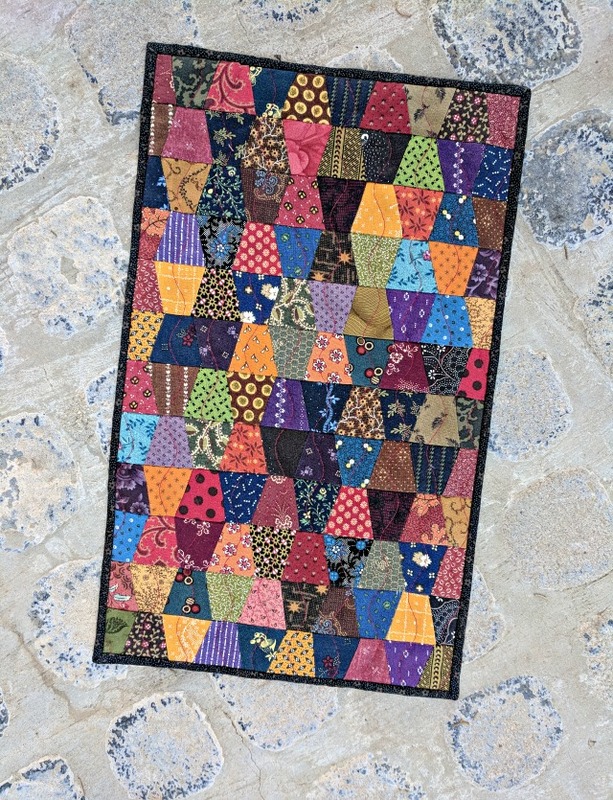 After inadvertently beginning a series of tumbler quilts in recent months, I could not resist purchasing a couple of packs and sewing them up into a very traditional, albeit tiny, quilt. If nothing less, the little diversion was just a really good reminder of where I've come from - basically, where we've all come from. There's no denying that no matter what my current style - or yours - it's all rooted in a time long ago. And venturing back now and then feels like a good way to carry on that connection, don't you think? The little tumbler shapes finished at 1 1/8"(!) tall and even though the website says each pack of 60 shapes contain 2 of 30 different prints, I found 30 unique designs in each pack, and the two packs I used weren't even identical. So that variety was fun, and the quick little sew finished at 9" x 15". I couldn't resist naming it "Single Shot" as a nod to its kindred quilts. And with this one, I'm more sure than ever that it won't be the last. How fun to find the pre-cuts. It makes a sweet finish, and I love the nod back and thinking about where our quilting / work started. How cute! I go back and forth all the time. I have always been drawn to traditional but also love cutting edge modern. We are now up in Monroe WA. Lovely ! Fun to see a traditional quilt over here ;-) I enjoyed reading about your thoughts on roots and style evolution. My first love is traditional quilts, so of course this one really captured my interest. It's a tiny beauty! I love the story you got into with the history of quilting. The history of quilting is so amazingly interesting. I think it is because these women were the silent side of history . . . the real women not the politicians and the wealthy men that built our nation. I love reading stories that go beyond the schooldays history books. The special hard working people. Haha - love the 'inadvertently'! My stash still has fabrics that are testimony to my beginnings. I dragged one out for a bee block this month and was surprised that it actually looked good! Great little quilt. I love that you equate this with where you started from. It is nice to revisit and see just how far you've come. I'm totally crushing on the mini tumblers...you know this! Oh my so tiny! It is a good thought to venture back once in awhile. I think most all fabric has it's own special charm when used well regardless of whether its modern or not. Not all my fabrics are modern but I still like them. Your mini is definitely charming. Tumblers, so classic. Some things never go out of 'style'. You got the contrast perfect. I love reading stories that go beyond the schooldays history books. The special hard working people.